With recent packed performances at Canadian Music Week (CMW), showcased on CTV News, an opening spot for super group Magic! 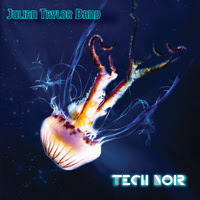 at the Mod Club, and a date at The Toronto Centre for the Performing Arts, THE JULIAN TAYLOR BAND has officially release the already widely-acclaimed CD TECH NOIR. Toronto-based award-winning singer-songwriter Julian Taylor and his band are thrilled about the reaction of their much anticipated new album TECH NOIR. The first single “Never Gonna Give You Up” has already been nominated as a semi-finalist in the International Songwriting Competition and the video has blown up on YouTube with more than 300,000 views – the track storming the Top 40 on the Canadian Alt Rock chart. In addition, The Julian Taylor Band’s previous member and bass player, Ben Spivak, – who now plays with the massively successful “Magic” – has several song co-writes and also plays on Tech Noir. The band is currently comprised of a group of formidable musicians – Julian Taylor (vocals and guitar), Jeremy Elliott (drums), Steve Pelletier (bass) and David Engle (keys). A truly gifted performer, Taylor has a distinct delivery that’s raw and emotional. The sound on Tech Noir is a culmination of every musical genre that has influenced him throughout his life and his most recent reincarnation sees him moving towards the kind of music that inspired him as a child. While even more energetic in their live performances, the band’s new soul-driven pop-rock is inspired by the likes of Lenny Kravitz, Stevie Wonder and Bill Withers and this is reflected on the new album.